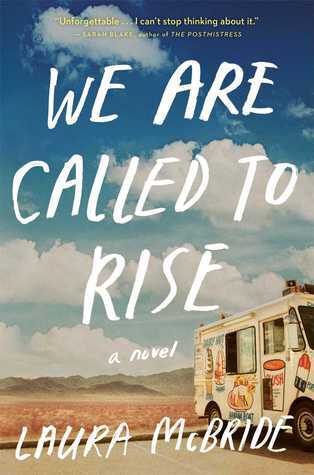 WE ARE CALLED TO RISE, by Laura McBride, grabbed me like a vice from page one. This author is someone to watch. The lives of four people from totally different walks of life merge in what is both tragedy and inspiration. The first chapter is told in the voice of Avis, the middle-aged housewife,who is lying in bed just at dawn thinking of her naughty underwear drawer. She knows she needs to do something to put the spark back into the life of her marriage to Jim. But, for her, there is no desire. And just as she bends over naked and silently opens the drawer, she catches sight of a totally alien object lying nestled on top of her lingerie. Her husband Jim is awake and decides to tell Avis what he really wants from her. The chapters alternate in voice. Luis is the wounded soldier, home from Iraq and hospitalized in Walter Reed in D.C. for his injuries which are more mental than physical. Luis is dealing with a moral dilemma of epic proportions. More about the repercussions of war, not about the war itself. Bashkim is the eight-year-old Albanian boy who lives with his Nene and Baba and baby sister in the dark area of Las Vegas. The family runs an ice cream truck. And the father is very angry after being imprisoned in Albania for no wrong-doing. But Bashkim has written a letter to a soldier at war and gotten a response. A game-changer in the making. Roberta is the social worker who connects with needy children. She knows her away around the seedy part of Las Vegas, the dark side of the city visitors rarely encounter. But I found Roberta’s character probably the weakest. Her character was needed to move a part of the novel. So it worked. How these people come together is a marvel of story telling. You will find yourself rooting for them all to win. Laura McBride is an English teacher in Las Vegas. Her children are grown and have flown the nest. Now she has settled down to write. She knows Vegas backward and forward. And it shows. We get a chance to learn about the neighborhoods where the working-class live. No one could have done it better! I can’t wait to see what she’s working on next. I am also announcing the winner of my latest giveaway: The winner of THE BOOKMAN’S TALE by Charlie Lovett is Pat Impens. Congratulations Pat!! I will send you an email letting you know where to send your mailing info. Thanks so much to all my readers who made comments to win. And a huge thanks to Penguin Group for providing my giveaway copy. ← Winner of JAMES MADISON by Lynne Cheney Revealed! This one sounds really, really good and totally my thing. It’s always such a surprise and pleasure when an author visits my website and comments on my review of their book. I was very touched with the story. It is one of the 20 books coming along on my lecture tour this coming season. Thanks so much for writing it. It is amazing.